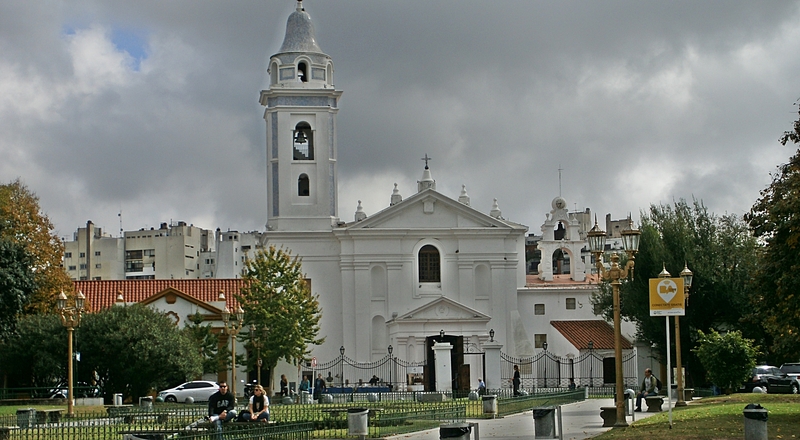 Visiting Cementerio de la Recoleta is unforgettable. 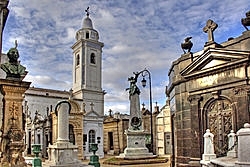 The cemetery has tombs and elaborate mausoleums of notable Argentinians including presidents, Nobel Prize winners, writers, poets, priests, military men, statesmen, Eva Perón, and a granddaughter of Napoleon. It’s known as one of the world’s most beautiful cemeteries and a “relevant historical and artistic monument of Argentina”. Its residents “lie in silent testimony honored by the presence of thousands of Argentine and foreign visitors who enjoy a truly magnificent human creation”. 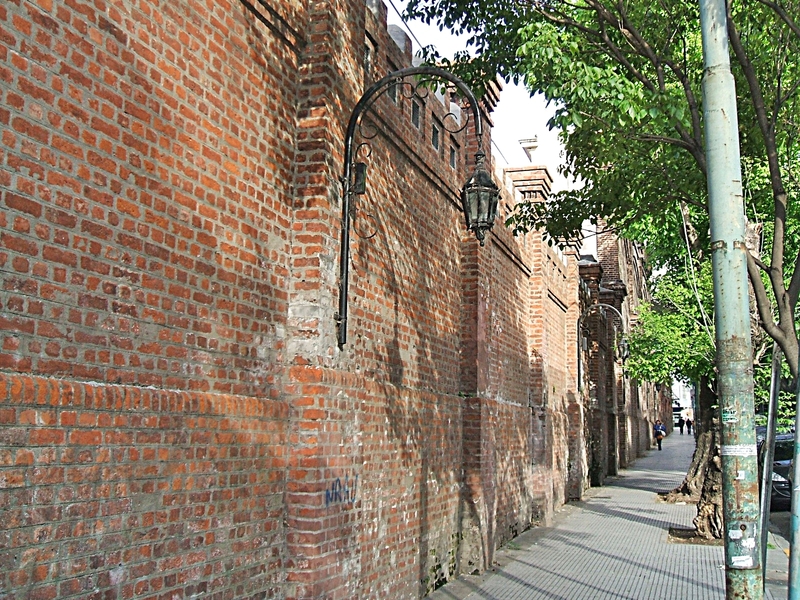 The cemetery is set on 14 acres in Buenos Aires Recoleta neighborhood and cordoned off by a brick wall. The elaborate tombs in the cemetery create an eerie yet mesmerizing symmetrical pattern of crosses and angels spread out against the sky. Most people find visiting the cemetery one time isn’t enough. Having a guide walk with you to point out the details of some of the more interesting mausoleums is worthwhile. There is so much history, art, and symbolism in the cemetery it’s difficult to comprehend and grasp much of it in one visit. The tombs are close to each other and depending on the time of day and weather, getting good photos can be difficult. Some of the tombs are marble and others stone. 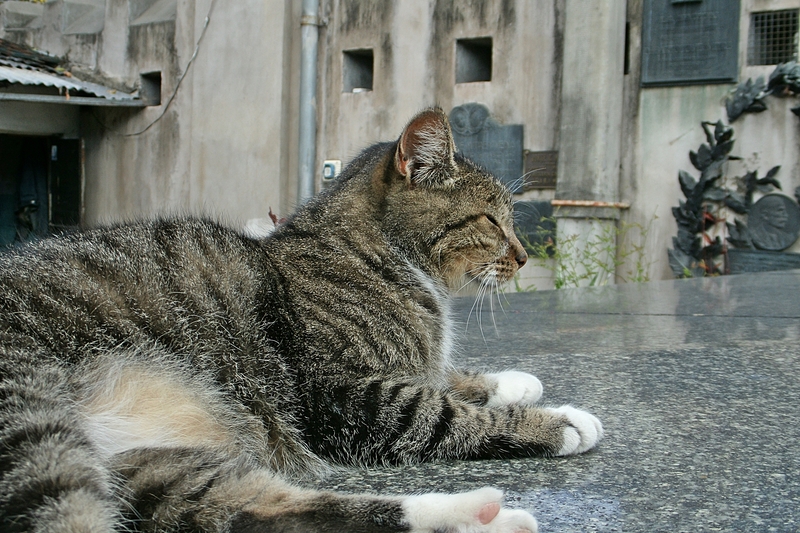 A few stray cats live in the cemetery and are known as the cemetery “caretakers”. The groundskeepers must feed them as they are friendly and healthy. The cemetery was built around the convent gardens of the Jesuit Order of the Recoletos Monks who lived in the area in the early eighteenth century. Beautiful Iglesia de Nuestra Señora del Pilar built in 1732 is part of the grounds. 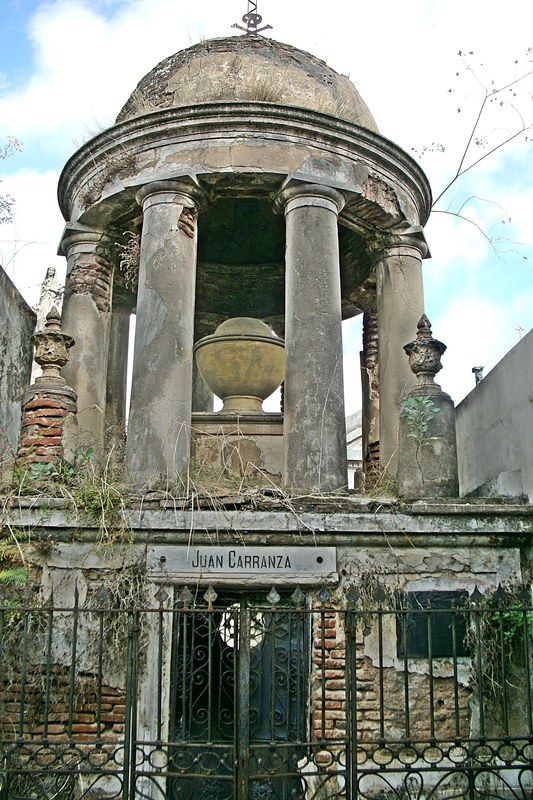 Recoleta Cemetery became the first public cemetery in Buenos Aires In 1822. 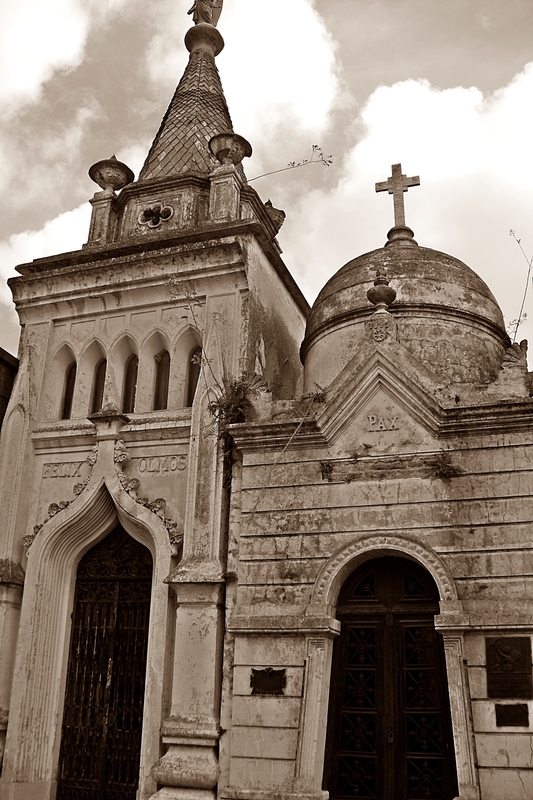 Governor Martin Rodríguez and government minister Bernardino Rivadavia were responsible for creating the cemetery. 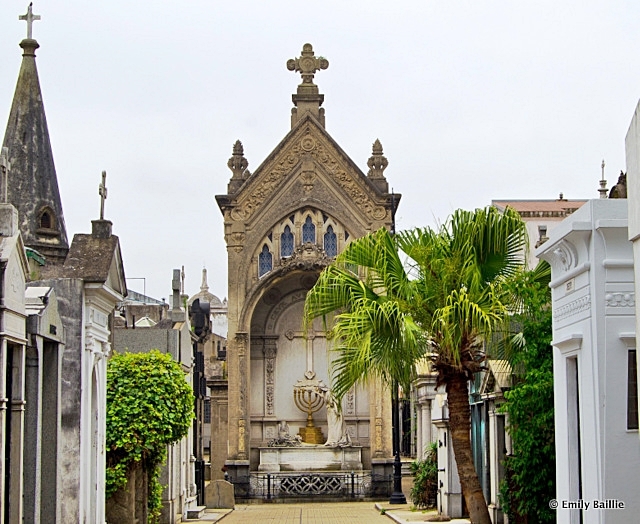 A French civil engineer designed the original layout and an Italian architect remodeled the cemetery layout in 1881. The cemetery has 4,691 vaults, all above ground. Ninety-four of the vaults are National Historical Monuments protected by the Argentine government. Entrance to the cemetery is through striking neo-classical gates with tall Doric columns. 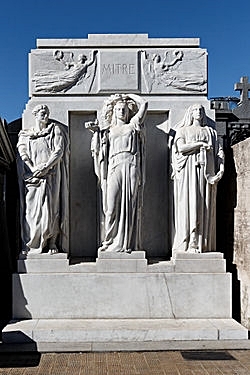 The elaborate marble mausoleums have decorative statues in a variety of architectural styles such as Art Deco, Art Nouveau, Baroque, and Neo-Gothic. Between 1880 and 1930 most materials used to build tombs were imported from Paris and Milan. The design of each mausoleum reflects the life of the family or person buried. Many are breathtakingly beautiful. The cemetery is laid out in sections like city blocks, with walkways branching into sidewalks filled with mausoleums. Among the memorials are works by Argentine sculptors like Lola Mora and Luis Perlotti. 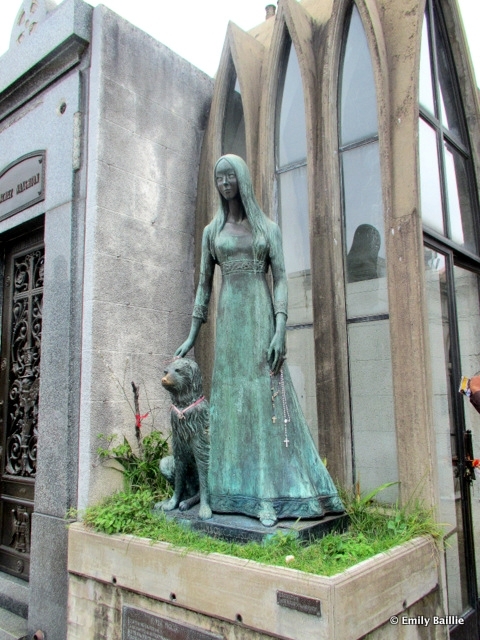 The unusual tomb of Liliana Crociati de Szaszak is of special interest. Many flock to the tomb of Evita and the Duarte family which is beautiful but not the most impressive. The grounds are well maintained and most of the mausoleums are in good condition. A few of the older ones are crumbling and need repair. Sadly, a few have broken glass and litter. 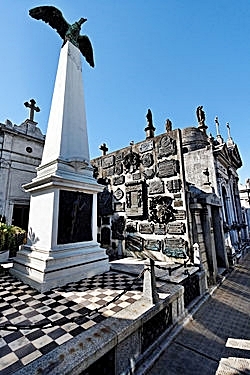 This entry was posted in Argentina, South America and tagged Bernardino Rivadavia, Crociati de Szaszak, Iglesia de Nuestra Senora del Pilar, Jesuit Order of the Recoletos Monks, Lola Mora, Luis Perlotti, Martin Rodriquez, Tomb of Evita and the Duarte Family, Tomb of Liliana Crociati de Szaszak by suemtravels. Bookmark the permalink.